This looks like so much fun! 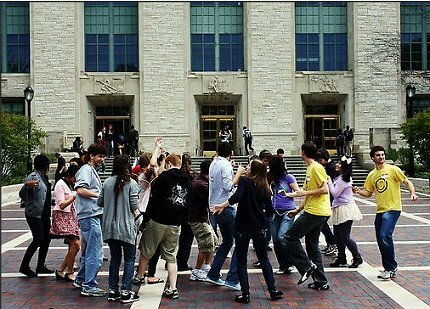 On May 20th, 22 students gathered with their iPhones and headphones and began dancing to a pre-selected 13 minute playlist. This was the second annual gathering of this event sponsored by the Northwestern Happiness Club. Some students shared their headphones with latecomers, and other students just walked by and smiled. At the end of the event everyone gathered in a circle, put their hands in the center, and yelled out something that made them happy. I love that the sangha can form anywhere. Wherever we go, there are people that we can learn from, share with and form communities. This event sounds like so much fun. Why didn't they have things like this when I was in college? It sounds like it could be a really good idea for a Meetup. On the one hand, this event might not be for people following the seventh precept of Buddhism of avoiding singing, dancing and grotesque mime, but I think there could be some benefits to an event like this. It is a good thing when people come together to form a community for purposes that are not harmful. The sangha is one of the three gems that people who espouse Buddhist beliefs go to to seek refuge from suffering. Secondly, many of us are so attached to our images of ourselves that I think it's sometimes good to embarrass ourselves a little. Instead of our self-cherishing and attachment to our delusions, we can realize that we are not the most attractive person on the planet and that we look incredibly goofy when we dance.